The Global Volcanism Program has no activity reports for Fuerteventura. The Global Volcanism Program has no Weekly Reports available for Fuerteventura. The Global Volcanism Program has no Bulletin Reports available for Fuerteventura. Pleistocene and Holocene cinder cones and lava flows cover large portions of elongated Fuerteventura Island at the SE end of the Canary Islands. The youngest lavas are found at the northern and central portions of the arid, sparsely vegetated island. Malpais de la Arena, the Northern Malpais, and the Lobos Island areas at the northern tip of Fuerteventura are the sites of broad fields of youthful cinder cones and lava flows. The Malpais Chico, Malpais Grande, and Malpais de Jacomar areas on the south-central part of the island represent smaller zones of youthful volcanism, as do the volcanoes of Pajara, which were constructed on the older plutonic massif west of the axis of the island. No historical eruptions are known, although the very youthful appearance of lava flow surfaces in the central part of the island suggests a late-Holocene or prehistoric age. This volcano is located within the Fuerteventura (Canary Islands), a UNESCO Biosphere Reserve property. Arana V, Carracedo J C, 1979. Los Volcanes de las Islas Canarias. II. Lanzarote-Fuerteventura. Madrid: Rueda, 176 p.
Fuster J M, Cendrero A, Gastesi P, Ibarrola E, Lopez-Ruiz J, 1968. Geologia y Volcanologia de las Islas Canarias - Fuerteventura. Madrid: Inst "Lucas Mallada", 239 p.
The Global Volcanism Program is not aware of any Holocene eruptions from Fuerteventura. If this volcano has had large eruptions (VEI >= 4) prior to 10,000 years ago, information might be found on the Fuerteventura page in the LaMEVE (Large Magnitude Explosive Volcanic Eruptions) database, a part of the Volcano Global Risk Identification and Analysis Project (VOGRIPA). There is no Deformation History data available for Fuerteventura. There is no Emissions History data available for Fuerteventura. Pleistocene and Holocene cinder cones and lava flows cover large portions of elongated Fuerteventura Island at the SE end of the Canary Islands. 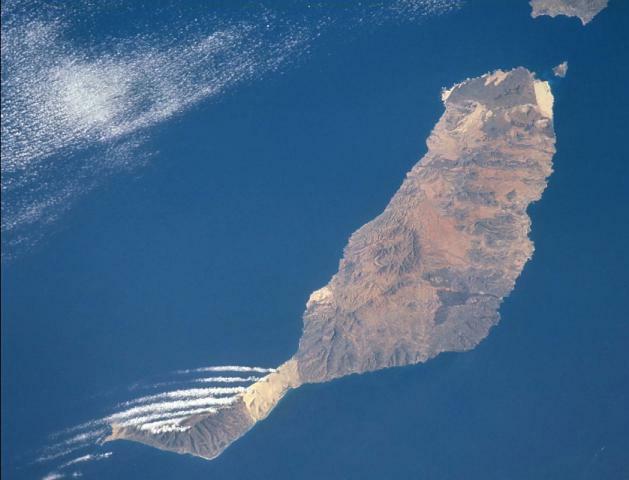 As seen in this Space Shuttle image, the youngest lavas form the darker colored areas at the northern tip of the island (including the small Lobos Island opposite the light-colored area on the NE tip of Fuerteventura) as well as in the south-central part of the arid island. Linear weather clouds extend from the SW tip of the island. No historical eruptions have occurred on Fuerteventura. NASA Space Shuttle image ISS002-732-26, 2001 (http://eol.jsc.nasa.gov/). The Global Volcanism Program has no maps available for Fuerteventura. There are no samples for Fuerteventura in the Smithsonian's NMNH Department of Mineral Sciences Rock and Ore collection. IRIS seismic stations/networks Incorporated Research Institutions for Seismology (IRIS) Data Services map showing the location of seismic stations from all available networks (permanent or temporary) within a radius of 0.18° (about 20 km at mid-latitudes) from the given location of Fuerteventura. Users can customize a variety of filters and options in the left panel. Note that if there are no stations are known the map will default to show the entire world with a "No data matched request" error notice. Large Eruptions of Fuerteventura Information about large Quaternary eruptions (VEI >= 4) is cataloged in the Large Magnitude Explosive Volcanic Eruptions (LaMEVE) database of the Volcano Global Risk Identification and Analysis Project (VOGRIPA).